NOTE 2/2012: Rue du Thé no longer carries Jade Chocolates. Tucked behind some shops in downtown Burlingame is a new place to sit and enjoy chocolate & tea. 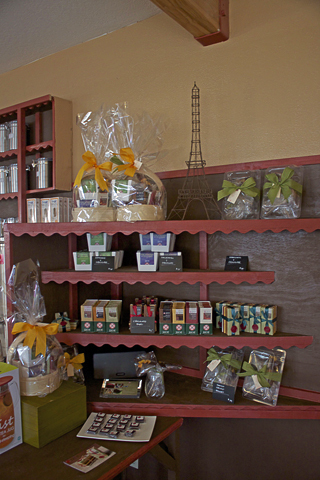 Rue du Thé, a chocolate & tea house, is a charming spot in a charming town to enjoy artisan chocolates, hot chocolate and a full tea service courtesy of Jade Chocolates and Leland Tea Company. There are plenty of tables both inside and out at this comfortable space, which is open 7 days a week, 10-7, to satisfy your chocolate cravings. Mindy shows Rico how to prepare hot chocolate in the kitchen at Rue du Thé. Chocolates are made on the premises, so if you come by in the morning you are likely to see Mindy Fong, Jade Chocolate founder, whipping up her truffles. 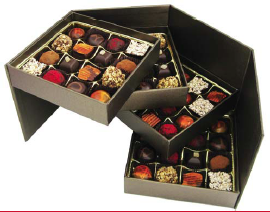 If you’ve ever been lucky enough to try her flavor-packed truffles (not easy to find in stores), this is awesome news — you don’t have to wait for a chocolate salon or other special event. 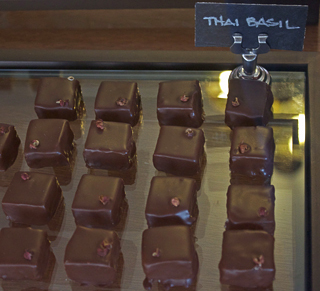 Jade truffles are available everyday at Rue du Thé. Thai Basil: A good choice when available. Selection varies depending on the day of the week. We stopped by on a Wednesday, which Mindy told us was the day of the week with the smallest selection; Thursdays and later in the week are better. Even so, there were 5 varieties of truffles to choose from (mostly tea flavored, but we also got Thai Basil ones), along with Jade bars, chocolate-dipped treats and hot chocolate. You can find all Jade products for sale at Rue du Thé. We had a cup of the hot chocolate. I forgot to ask what flavor it was, but it had the malty taste of Jade’s Genmai chocolate bar — it was like drinking a Jade bar. Split between 2 people, it was totally satisfying — the sign of good chocolate in my opinion. With high quality, you don’t need a large quantity. A hot chocolate menu is in the works. 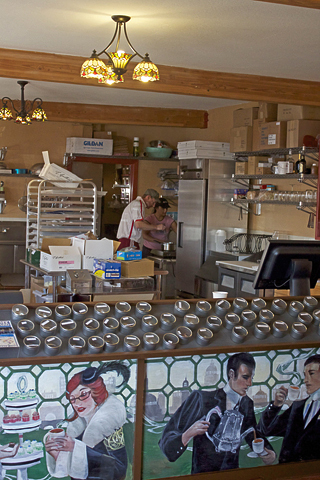 There is also an extensive tea selection and tea service menu courtesy of Leland Tea Company. Mindy has plans for more chocolate-centric events, including chocolate-themed tea parties, classes on chocolate and tea, and hands-on chocolate-making classes. With her own space for making and selling chocolates, Mindy will be creating more kinds of chocolate treats that you will only find here. Coming up are chocolate bark and Rice Paddies, which she described as like Rice Krispies Treats only with chocolate instead of marshmallow. Rico, the friendly counter person, told us they’ve been busy with business increasing everyday. 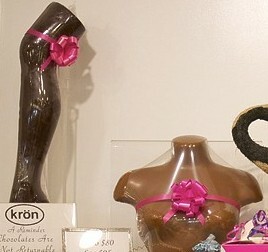 We wish them continued success and urge you to check out Rue du Thé and support your local artisan chocolatiers. Rue du Thé Tea House, 1223 Donnelly Ave., Burlingame, is conveniently located next to a public parking lot and only 3 blocks from the Caltrain station. If you don’t live nearby, make it part of your next staycation in SFBA. Date posted: September 1, 2011. This entry was posted in Local chocolate, Peninsula chocolate and tagged artisan, basil, hot chocolate, Jade Chocolates, rice krispies, Rue du Thé, tea, truffles. Bookmark the permalink. Otero or His shop, Rue Du The.